In today’s post, Jeff Duke, author of Ghostly Tales of Mississippi, shares with us how he became interested in ghosts and all things paranormal. When I was a kid—probably around 7 or 8 years old—my mom came home with a box of Honeycomb cereal. 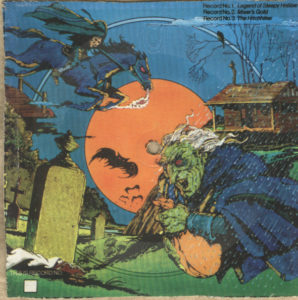 On the back of that box was a record of The Headless Horseman that you could cut out and play on a turntable. While I was scared of the Headless Horseman story, I was terrified of the picture on the record. I remember actually screaming one time when somebody hid that record in my bed so that it would be the first thing I saw when I pulled the covers down. I was terrified of that thing. But I was also kind of excited and intrigued by it. I think that’s when my love of horror and scary things began. On Friday nights, you would always find me up late at night, alone, glued to the TV for Friday Night Frights. I’d watch the old Universal monster movies and the old Hammer movies late into the night. One evening they showed Stanley Kubrick’s version of The Shining. That one really did a number on me. I distinctly remember getting up and flipping the channel back and forth when Jack Nicholson discovers there really is someone—or something—in room 237. The only other time a movie scared me as much as The Shining did was when I saw Ghost Story, which I watched by myself on a cold, misty fall night, sitting in my grandfather’s truck at the drive-in theater he owned. In 7th and 8th grade, I spent a lot of time in detention for all manner of idiotic reasons. It was in detention that someone handed me a copy of Stephen King’s Night Shift. From there, I was hooked. I read everything he released. H.P. Lovecraft was another writer I discovered around this time. Soon, the stories I was writing began to evolve. Whereas I’d previously been writing fantasy inspired by Dungeons and Dragons (yes, I was a D&D kid), I was now trying my hand at writing my own horror stories. I’ve been writing them off and on ever since. Ghosts have always interested me more than any other horror creature. My grandmother helped nurture my love of ghost stories from an early age. I first heard about Witch Dance from her. So it’s fitting that I put a story about Witch Dance in my first book of ghost stories. I added my own touch to it, but the story is essentially the same—some kids go hunting for the ghost witch and, unfortunately for them, they find her. I’ve also had my own run-in with a ghost. The story in my book about the Longwood home is largely based on something that happened to me as a kid while touring the mansion. I can still see that lady walking around in the adjacent room, even after all these years. I remember it as clearly as I remember the picture on that cereal-box record that scared me to death. Speaking of that record, I actually found it again when I was home visiting my folks. I was digging through some cabinets, looking for old childhood treasures, when there it was in all its horrific glory. And, if I’m telling you the truth, it still unnerved me a little bit. And, weirdly enough, that makes me really happy. Order your very own Ghostly Tales of Mississippi by Jeff Duke here.